There are a number of differences between those who indulge in tax fraud and those who indulge in benefits fraud. The most basic is money: to dodge tax you probably have money, to steal benefits you probably don't. Is it this basic financial distinction that accounts for the differences we describe below? 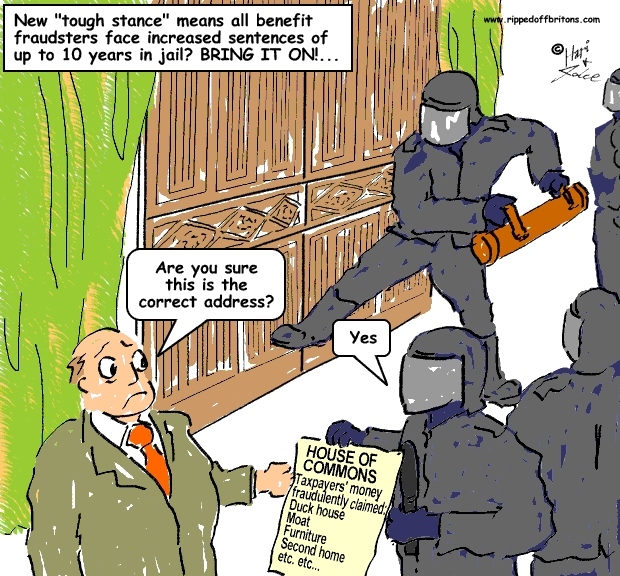 Do well paid legislators and prosecutors feel more empathy with tax dodgers then benefits cheats? Taxes: 6.7% of all taxes are not paid fraudulently (i.e. doesn't include 'avoidance' which uses legal loopholes). Even though Tax Fraud is a far bigger problem, there were 16 times more criminal prosecutions for benefits fraud than for tax fraud in 2012! 9,836 criminal prosecutions for benefits fraud. 617 criminal prosecutions for tax fraud. "I think what bothers members of the public is the vigour with which the authorities pursue people who defraud a few thousand in benefit compared with the vigour with which we pursue people who evade thousands and thousands in tax"
In response the HMRC representatives burbled incoherently (burbling incoherently is a tried, tested, and invariably successful evasive manouevre in parliamentary committee meetings). The Tory led government announced in December 2013 the abolition of the National Fraud Authority. So presumably we won't have the benefit of embarrassing statistics like this next year. How disappointing.
" A Labour Chancellor will not permit tax relief to millionaires in Tax Havens " Brown Labour Conference 1996 " we are taking action on Tax Avoidance for 18 years they ( Tories) failed to do so" Brown 15/11/98 all sorted then eh !!! And then there's the buy to let-ers who're soaking taxpayers via housing benefit and the businessmen who refuse to pay decent wages and we have to subsidise them with working tax credits. They're costing us millions.